Some 65 University of Florida College of Education faculty and graduate students were among the 15,000 scholars from around the world who converged on San Antonio, Texas, from April 27 to May 1, for the 2017 Annual Meeting of the American Educational Research Association to examine critical issues of education research and public policy. The AERA meeting is the largest gathering of international scholars in the field of education research. More UF education faculty and graduate students, from multiple disciplines, attend AERA’s annual meeting than any other professional gathering. This year’s UF contingent included 28 College of Education faculty members and 37 graduate students in education. 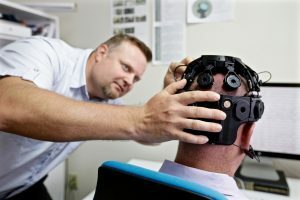 UF Ed Tech faculty researcher Pasha Antonenko, shown adjusting the EEG headgear of a study subject in his neuro-education lab, was ultra-busy at the AERA conference with 13 presentations and sessions. The massive AERA gathering is a showcase for groundbreaking, innovative studies in a diverse array of education issues and trends. This year’s conference theme focused on “Knowledge to Action: Achieving the Promise of Equal Educational Opportunity.” The meeting featured some 2,600 sessions including general, division and specialty sessions, paper and poster presentations and symposiums, roundtable discussions and professional development courses. The busiest COE attendees was Education Technology faculty researchers Pasha Antonenko, who had roles as presenter, co-researcher, discussion leader, meeting chair or other involvement in 13 research presentations and sessions, and Albert Ritzhaupt with a similar variety of roles in eight presentations and sessions. You’ll also could find the name of Walter Leite (Research and Evaluation Methods) appears five times in the conference program. Among doctoral student participants, doctoral candidate Ren Liu (REM) was involved in four AERA presentations; five doctoral students each participated in three research presentations or sessions: Stephanie Schroeder and Selcuk Dogan (both from Curriculum, Teaching, and Teacher Education); and Robert Davis, Jahui Wang and Wenjing Luo f(both rom Education Technology). A complete listing and schedule of conference presentations and participants’ roles is available at www.aera.net.